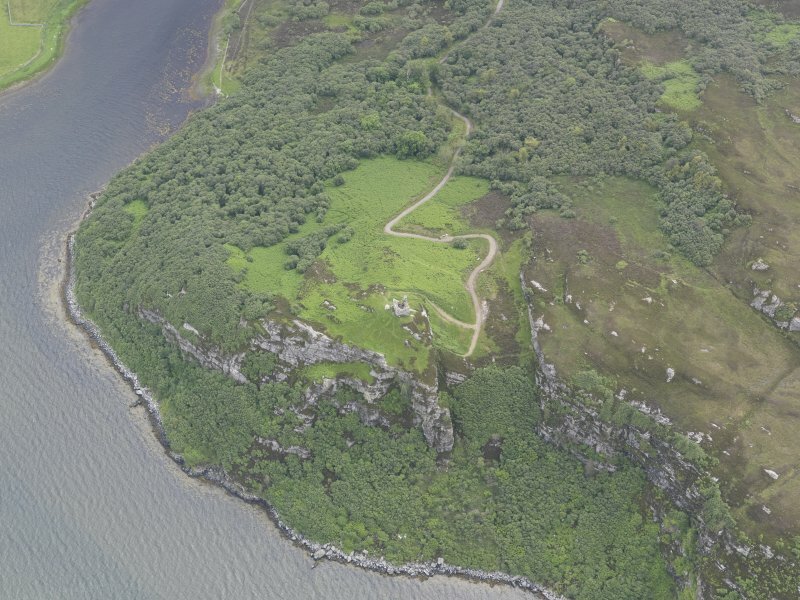 Oblique aerial view of Caistal Bharraich tower house, looking to the W.
Oblique aerial view of Caistal Bharraich tower house, looking to the SE. 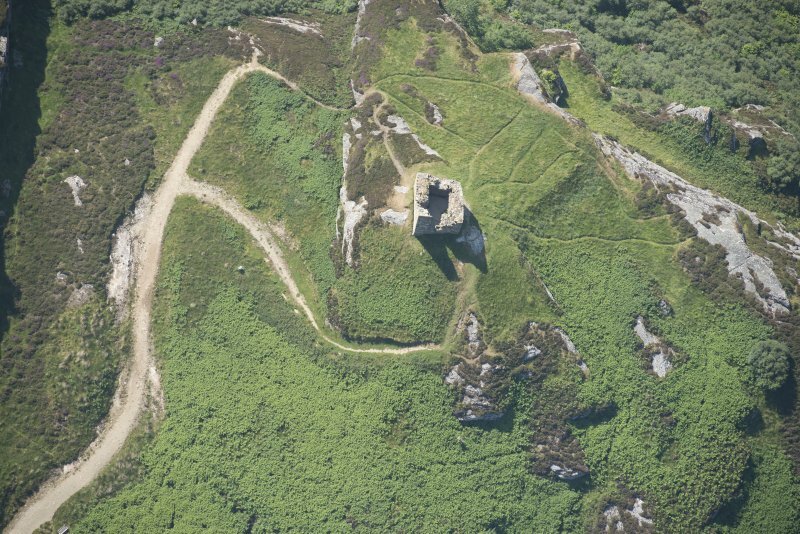 Oblique aerial view centred on Caisteal Bharraich, looking NE. 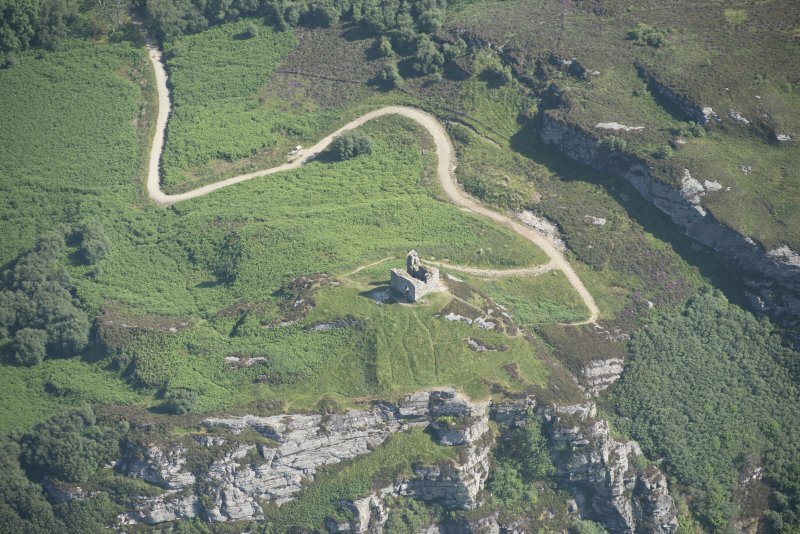 Oblique aerial view centred on Caisteal Bharraich, looking ESE. 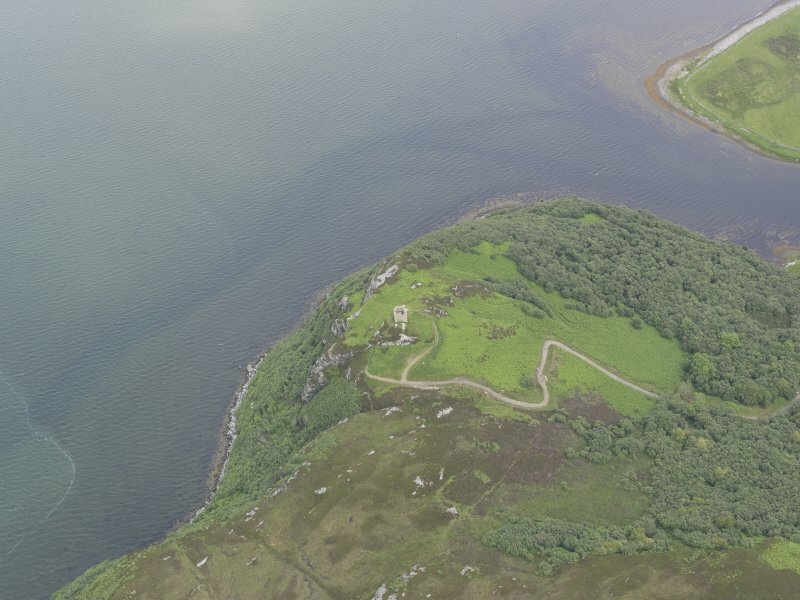 Oblique aerial view of Caistal Bharraich tower house, looking to the WNW. 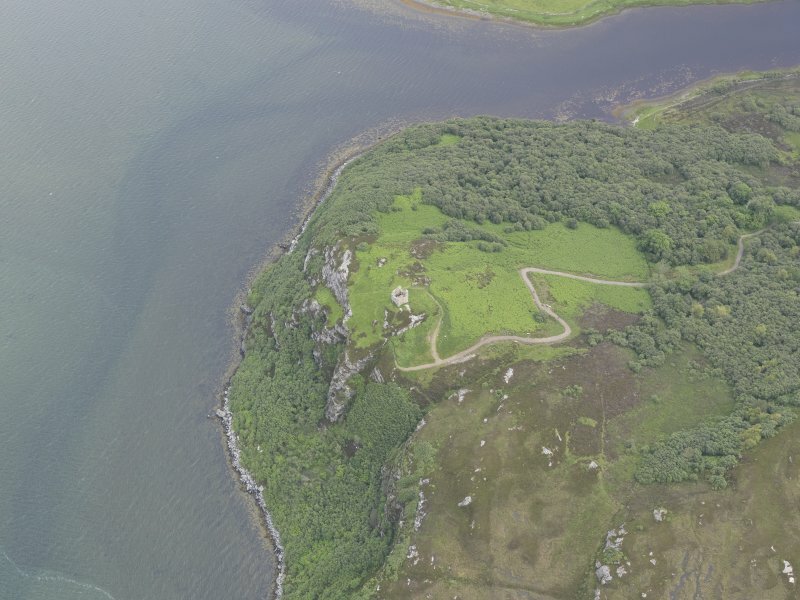 Oblique aerial view centred on Caisteal Bharraich, looking N.
Oblique aerial view centred on Caisteal Bharraich, looking SE. 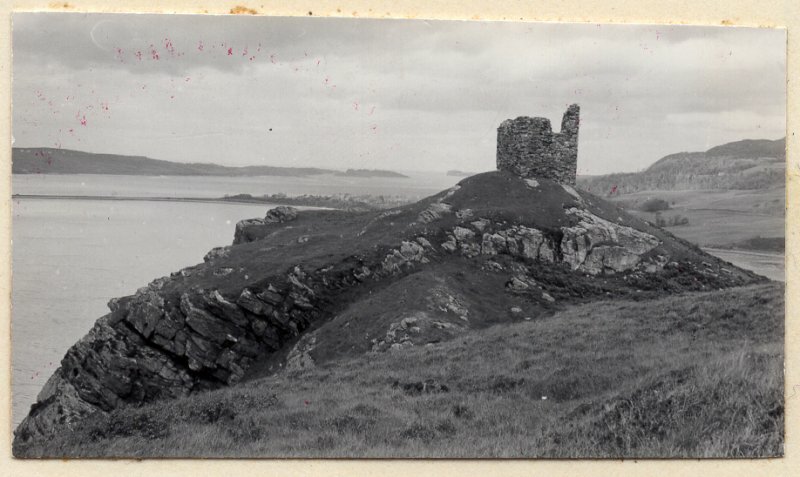 Caisteal Bharraich, a sub-rectangular tower on a rocky knoll. It measures externally 7.5m along the south wall and 6.7m along the other three sides. The wall is 1.7m thick except in the NW corner where it is reduced to 1.4m and is bonded with shell mortar. There are suggestions that it is a possibly 16th century part-reconstruction of an earlier tower. 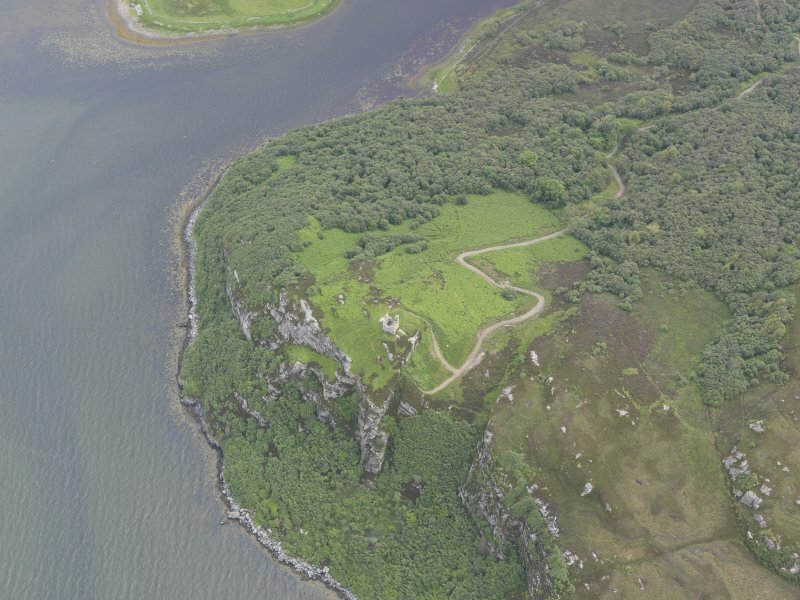 To the north is a scarp showing traces of walling, which extend NW for 20m from a rock outcrop near the tower to the coastal cliff. Surveyed at 1:2500. 2 photographs from 1960 attached to OS 495 card. 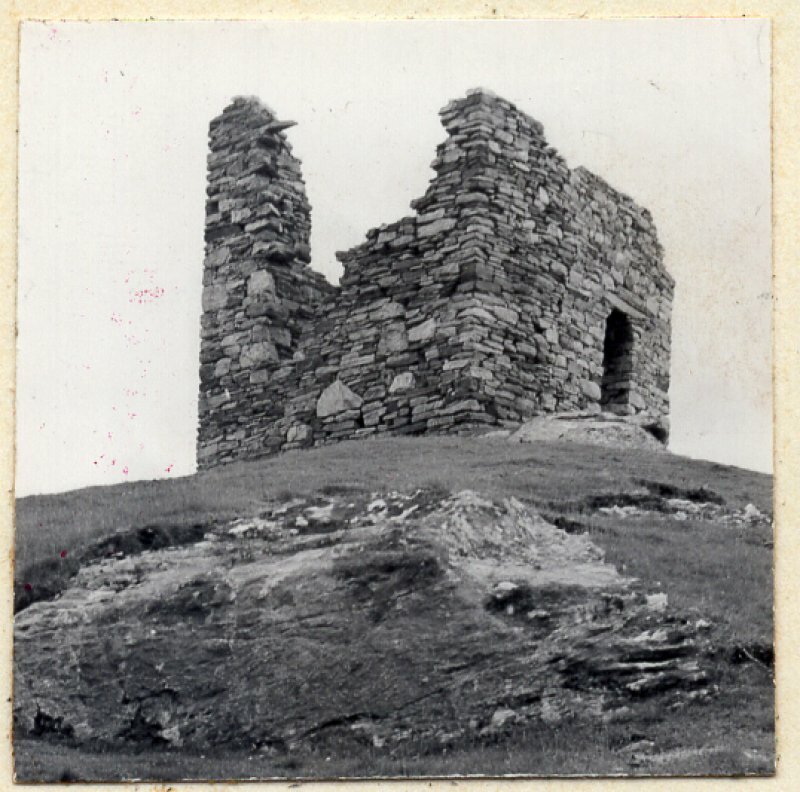 Castle Varrich or Bhurraich: the shattered remains of a small roughly-built tower whose history is unknown although it is said to have belonged to the Bishop of Caithness who stayed here on his way from his castle at Scrabster (ND16NW 3) to his property of Balnakiel (NC36NE 4). It appears to have been a house rather than a tower and is probably of late date. It consisted of two storeys with an attic, and probably a parapet. The walls are 4ft 6ins thick and the ground floor was vaulted but the arch has now fallen in. The ground floor was probably used for cattle and horses since there is no stairway to the first floor which was probably reached by a ladder. It had only one apartment. No change to preceeding field report. NC 58106 56777 Shell midden surveyed as part of survey in the Lochan Hakel area carried out by students from University of Aberdeen in July 2006. 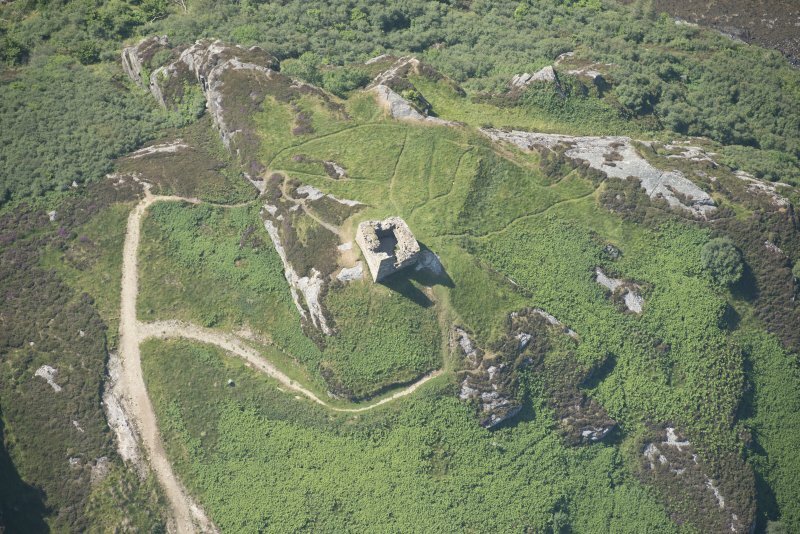 NC 58076 56755 A programme of archaeological works consisting of a watching brief during the removal of collapsed masonry, and the excavation of foundation trenches for a viewing platform were undertaken, October 2016 – January 2017. This work was part of a wider programme of conservation and interpretation work designed to stabilise this ruinous structure and improve public access. The watching brief was implemented to identify any significant stonework that might be present in the collapsed masonry. All of the stonework was found to consist of rough blocks of metamorphic and sandstone rubble and was not considered architecturally significant. collapse. Significant quantities of animal bone were recovered from throughout both deposits. Other finds consisted of part of a rotary quern recovered from just above the bedrock, and a small worked bone object recovered from a lens of ash situated between the upper and lower fills. Three smaller trenches excavated adjacent and external to the N façade of the tower house identified that the level of the bedrock dropped down sharply from S to N. Bedrock was reached in two of these trenches at a minimum depth of 0.65m, but was not reached within the third trench, where soil probing established that it was at a depth of >0.9m. No finds or features of archaeological significance were recorded in the trenches.